RESTON, Va. – Advanced melanoma, a type of skin cancer that has spread to other areas of the body, has a poor prognosis, but immune checkpoint inhibitor therapy can be effective for some patients. Research highlighted in the featured article of the September issue of The Journal of Nuclear Medicine demonstrates that combined positron emission tomography/computed tomography (PET/CT) scanning early in treatment could identify whether the therapy will benefit a particular patient. As the therapy has potentially serious side-effects, early determination of ineffectiveness could avert unnecessary risk exposure and provide the option of a different treatment. Immune checkpoint inhibitors (ICI) block certain proteins made by immune system cells, such as T cells, and some cancer cells that were keeping the immune system’s T cells from killing the cancer cells. When these checkpoint proteins are blocked by inhibitors, the immune system can function again and T cells are better able to destroy cancer cells. Determining response to ICI therapy has been challenging. “Current anatomic CT-based response criteria are typically performed at the earliest two to four months into treatment and are limited in their ability to assess stable disease and pseudoprogression,” explains Steve Y. Cho, MD, one of the lead authors of this prospective study funded by the Melanoma Research Alliance and conducted at Johns Hopkins University School of Medicine, Baltimore, Maryland, with Richard L Wahl, MD and in close collaboration with melanoma specialists Evan Lipson, MD, and Suzanne Topalian, MD. Hyung Jun Im, MD, is also a major contributor to this study with Cho, who is now at the University of Wisconsin School of Medicine and Public Health, Madison, Wisconsin. The study evaluated the use of 18F-fluorodeoxyglucose-(FDG)-PET/CT scanning as an early predictor of response to ICI therapy in 20 patients with advanced melanoma. The patients each had three scans: prior to treatment, at 21 to 28 days and at four months. The researchers developed criteria to predict eventual response to ICI with 100% sensitivity, 93% specificity and 95% accuracy. He cautions, “While immune therapies, including the particular class of immune checkpoint inhibitors used in this study, promise new hope for durable tumor responses and remission for a variety of cancers, they are not without a cost. The same immune cells triggered to attack cancer cells can also attack normal organs, causing immune-related adverse events, which can limit the continued use of these agents. Therefore, early discontinuation of these therapies can limit the risk for side effects and allow for initiation of other more effective treatment options.” The next step is for further studies with larger cohorts. The National Institutes of Health states that more than 1 million people in the U.S. are living with melanoma and estimates that in 2017 more than 87,000 new cases of melanoma will be diagnosed, and the cancer will cause nearly 10,000 deaths. According to the American Cancer Society, the five-year survival rate for individuals with stage 4 melanoma is only about 15 to 20 percent. These are proposed criteria for early prediction of eventual response to ICI therapy incorporating RECIST–based and PERCIST–based changes seen 3-4 weeks into treatment. Patients whose CT scans, performed 3-4 weeks into therapy, demonstrate an objective response (PR or CR by RECIST 1.1 criteria) are predicted to maintain a response at 4 months. Similarly, progressive disease detected at that same interval predicts continued disease progression at 4 months. 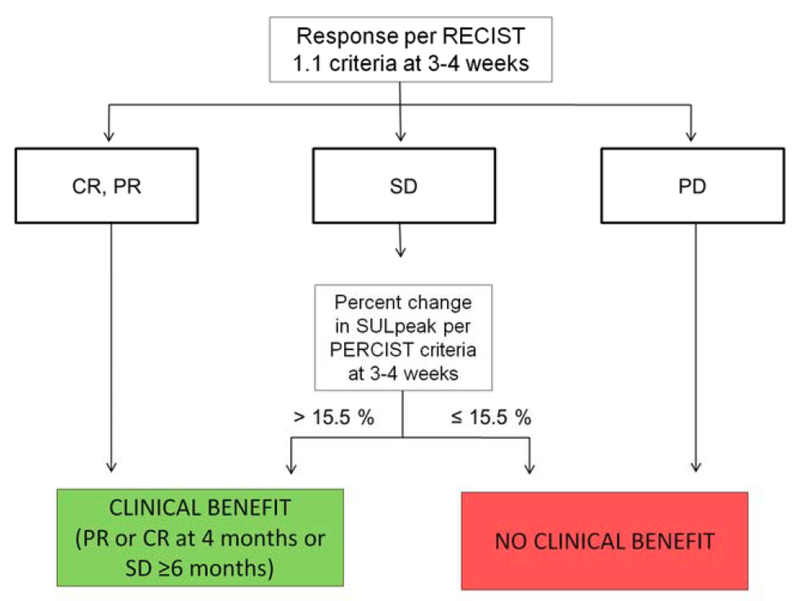 In patients with stable disease by RECIST1.1 at 3-4 weeks, an increase > 15.5% in SULpeak of the hottest lesion by PET is associated with eventual clinical benefit (PR or CR at 4 months or SD ≥ 6 months). The sensitivity, specificity and accuracy of the algorithm to predict response at 4 months were 100 percent, 93.3 percent and 95.0 percent respectively. CR, complete response; PD, progressive disease; PERCIST, PET response criteria in solid tumors; PR, partial response; RECIST, Response Evaluation Criteria In Solid Tumors; SD, stable disease; SULpeak, average standardized uptake value corrected by lean body mass within a 1-cm3 spherical volume of interest. The authors of “Prediction of Response to Immune Checkpoint Inhibitor Therapy Using Early Time-Point FDG-PET/CT Imaging in Patients with Advanced Melanoma” include Steve Y. Cho, Johns Hopkins University School of Medicine and Sidney Kimmel Comprehensive Cancer Center, Baltimore, Maryland, and currently the University of Wisconsin School of Medicine and Public Health and Carbone Comprehensive Cancer Center, Madison, Wisconsin; Hyung-Jun Im, University of Wisconsin School of Medicine and Public Health and Carbone Comprehensive Cancer Center, Madison, Wisconsin; Evan J. Lipson, Steven P. Rowe, Esther Mena Gonzalez, Amanda Blackford, Alin Chirindel, Drew M. Pardoll, and Suzanne L. Topalian, Johns Hopkins University School of Medicine and Sidney Kimmel Comprehensive Cancer Center, Baltimore, Maryland; and Richard L. Wahl, Johns Hopkins University School of Medicine and Sidney Kimmel Comprehensive Cancer Center, Baltimore, Maryland, and currently the Mallinckrodt Institute of Radiology, Washington University School of Medicine, St. Louis, Missouri. This study was supported by grants from the Melanoma Research Alliance, the National Institutes of Health (P30 CA006973 and 5U01CA140204), Genentech and Bristol-Myers Squibb.